...or at least I hope you want it. "It," of course, being the pattern for Bavarois. Say it with me now: "bah-vah-wah!" 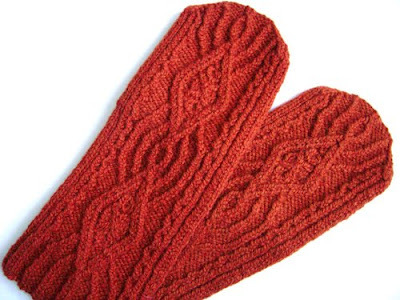 Bavarois is an elegant pair of sport-weight mittens with an elaborate (but shockingly straightforward) Bavarian twisted stitch motif running from cuff to fingertips. You can get it, of course, here on Ravelry, or here in my Etsy shop. Gauge: 6 stitches = 1 inch (2.5 cm) in Stockinette st.
Yarn: Two (2) skeins of Filature Lemieux Québécoise (210yd / 100g) in colourway 84 or the equivalent amount of any other sport weight yarn. A 15” piece of waste yarn of the same weight in a contrasting colour to hold the thumb stitches is also required. Needles: One set of five (5) double pointed needles in US 3 (3.25 mm) or size necessary to obtain gauge. Notions: A stitch marker to mark beginning of round (optional,) a cable needle (also optional,) and a sewing needle to weave in ends. Skills Needed: Knitting in the round, chart reading, twisted stitches, cabling, and grafting. Oh, and the charts are large and clear and have been meticulously colour coded for ease of reading. The charts in black and white were making me go cross-eyed! What this means is that the charts are there to make your (possible) introduction to the Wonderful World of Bavarian Twisted Stitches as painless as possible. Just another of the Spilly-services that we provide here at SpillyJane Knits. Love the pattern. I've got to finish my first pair of Spilly Mittens before I'm allowed to contemplate another one. January 22, 2009 at 7:06 p.m.
January 25, 2009 at 2:15 p.m.